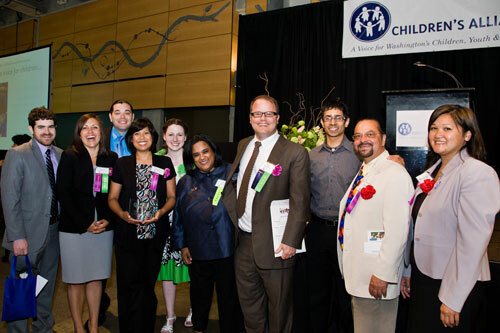 ACLU-WA Legislative Director Shankar Narayan was one of a group of lobbyists recognized with a Voices for Children award at the annual awards luncheon the Children’s Alliance on Tuesday. The lobbyist group, known as the Racial Equity Team, was presented the award in recognition of their work to advance racial equality issues in the 2012 legislative session. Shankar’s work for the group included spearheading its opposition to Attorney General Rob McKenna’s gang bill that would have disproportionately impacted youth of color, and helping defeat bills such as one that would have required DNA to be taken from those arrested but not convicted for certain crimes. There were also proactive victories, such as passage of the 364-day misdemeanor bill , which limits deportations that break up families, and the adoption of important policy priorities in a bill reorganizing the Sentencing Guidelines Commission. Allies participating in the group included lobbyists from SEIU 775, Washington CAN, OneAmerica, the Washington State Labor Council, and Solid Ground, among others.